Awareness is a skill that gets cultivated with practice, and over time, it can become a powerful force to facilitate positive, personal change. While an active yoga practice can be used to build this skill, one of my biggest transformations came as a result of being still. I had just lost my position teaching yoga in Brazil because the resort at which I worked was closing down with one weeks’ notice. Soon thereafter, I found myself at a 10-day silent retreat in the mountains to figure out my next steps. The silence only amplified the internal stress I was experiencing, and all I wanted to do was run from situation, my thoughts, and myself in general. By day 3, I broke past a barrier of pain and tears. After 10 days, I emerged like a butterfly from its cocoon—confident, empowered, purposeful, and clear-minded. This process I share with you below is modified from my time in stillness, and you, too, can receive amazing insights on how to embrace the incredible possibilities awaiting you now. The best part is that you don’t have to travel around the globe, or spend 10-days alone, to do it! Awareness is often defined as a heightened ability to understand one’s self and their surroundings. Yoga is an incredible practice to cultivate awareness, and it does this through the various practices of asana, pranayama, and meditation (Just to name a few). 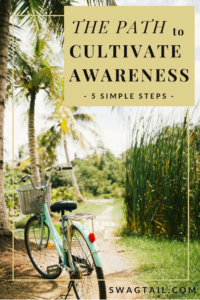 This blog post will focus on a practical approach to increasing awareness both on and off of the yoga mat through a series of 5 simple steps. The first three steps of this process are designed to cultivate awareness. Then, from this new place of attention, new mental and emotional shifts can be embraced. Use these steps over and over again–in various areas of life–to achieve the changes you desire. The purpose of step 1 is to train the mind to focus on one thing at a time. This is best done when removing all of the other distractions, and finding some quiet time alone. While it seems popular to brag about being able to multi-task, doing more than one thing at a time dilutes focus and hinders forward progress. There is an old adage that “less is more.” This is especially true when it comes to cultivating awareness. The beginning of every class is a perfect opportunity to invite students to practice the skill of focus. Start by having the student in any comfortable position (Savasana, child’s pose, or any comfortable seat). Instruct them to focus on one thing. This could be a part of the body, such as their third eye or heart. You could guide them to observe the rhythm of the breath. 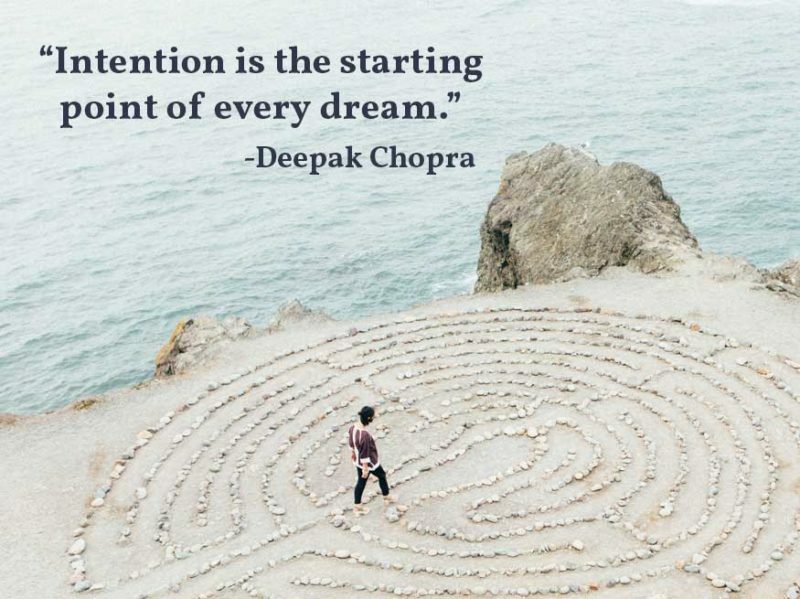 You might even have them set an intention, or say a mantra, to stay present. Instead of rushing into the asana practice, honor the value of being still here. Spend the quality time to address all aspects of the person—the physical, mental, and emotional–that are showing up for the practice. No matter what the point of focus, the principle is the same: Train the mind to focus on one thing at a time. The easiest way to practice single-minded attention at home would be to start a meditation practice. This should be when you can set a time to be quiet, get into a comfortable position, and be able to set the internal gaze on one point. If you are seated and alone, you could mirror the same tactics from a yoga class, but you could also stare at a candle flame or point on the wall. Anything to start minimizing distractions, and train the mind to focus now. In the present. To make this habit long term, tie it to another regular habit. For example, after you wake up in the morning, drink a glass of water and go to a quiet place in the house to meditation. Or, if you drop the kids off at school every morning, set aside 15 minutes afterwards drop off to reset your focus for the day. This might also be done before bed. Really, any time you already have a daily behavior already ingrained, you can attach a meditation practice to it. Your body changes all of the time. Your schedule, regular activities, habitual movements, sleep quantity and quality, all affect the state of the body. The senses of the body pick up information from the environment and store it within the body, for later understanding. The senses help us interpret the external world, and decide how to act and move within it. Did you know that the eyes are responsible for 80% of the sensory information obtained by the body? When you close the eyes, you can listen to the body more clearly. The purpose of paying attention to specific sensations in the body is to prevent unwanted feelings and information from being stored in the body. This information is what we call stress or tension, and if left unattended, escalates into dis-ease. Prevent this build-up, and return to a neutral place more regularly. 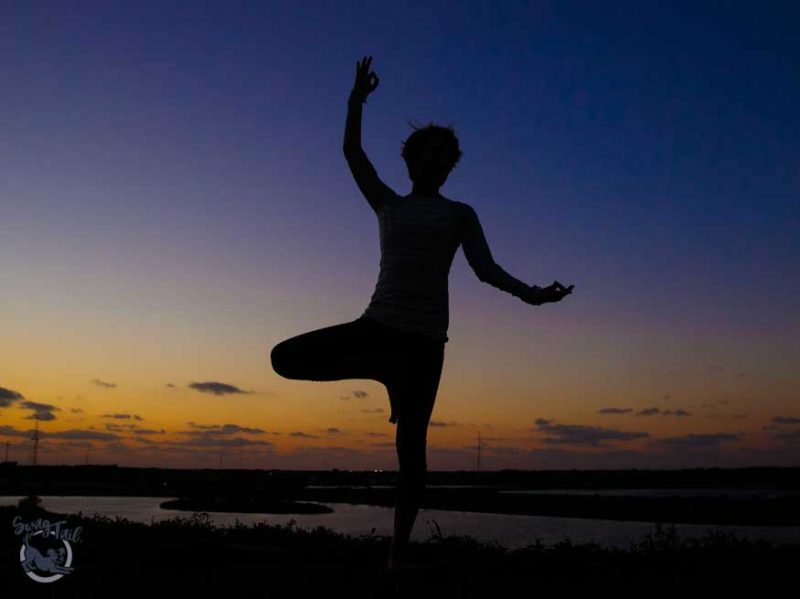 Stillness is a practice that is easily incorporated at the beginning and end of each yoga class. However, awareness of the body can be incorporated throughout the entirety of it. Moving the body through Sun Salutations? Notice the heartbeat and heat. Taking time to chill in child’s pose between sequences? Great! Notice which parts of the body gather attention first. Holding a challenging pose for a minute? Eliminate distractions by observing which muscles are doing the work to create the pose, and which ones can relax. Use Step 2 again and again, in all types of yoga classes, to maintain a connection to the body, and what information has been stored within it as a result of daily life. There are many meditation practices that scan the body as a way to stay focused. This is a way to combine steps 1 and 2, for those of you who would like to be most efficient with your time. Yet, the body changes continuously. I suggest setting reminders, on your cell phone, throughout the day to check in with what sensations are present. If the shoulders feel tight, see if your attention can begin to induce relaxation there. If your jaw is clenched, consciously let the lips lightly part and allow the tongue to rest comfortably at the bottom of the mouth. Remember, this is best coupled with a few minutes of stillness (such as meditation, or a conscious break in your day). Even if you set aside 5-10 minutes throughout your day, you can drastically begin to let go of any unwanted mental or emotional baggage. This will keep you refreshed and revitalized for longer periods of time. And, you won’t end up like the tin man at the end of the day, or completely immobile in the later years of life. Steps 1 and 2 increase our understanding of what currently is in any given moment, and Step 3 teaches us to observe it without attachment. You are a powerful, infinite being who is worthy of giving and receiving love, and you’re are worthy of the best that life has to offer. Acceptance is recognizing this –no matter what is going on in your life, or how you feel, at this very moment. This is similar to the Buddhist concept of non-attachment, where you learn you are not defined by anything external and thus do not need people, places or things to validate your experience. When you embrace an attitude of acceptance, you remove any resistance to the unwanted thoughts or conditions that surfaced in the stillness of Step 1. Acceptance moves you up the vibrational, emotional scale. And, focus is taken from the past or future and returned to the present moment. This place, free of resistance or attachment, is where powerful change for our future can be made. Encourage students to welcome shaking of the body when poses get tough. I always like to say, “It’s better to shake now than when you’re old.” This generally lightens the mood and reminds students that the muscular tremors are a sign of building strength now–a strength that lasts much longer than the short time spent on the mat in class. Teach students to use props when their current level of flexibility limits them from taking the “picture-perfect” version of the posture. Is their mind racing as they enter class? Remind them that’s okay. Are students exhausted as they walk into an evening class? Repeat the fact that our energy levels fluctuate constantly, and you can always do your best with what you’re working with at the moment. At the end of every one of my classes, when hands are in Anjali Mudra, I have students thank themselves for carving out this time for their practice. However, this could be done at the beginning and end of any class. The important thing to remember is that acceptance embraces the moment, the body, the mind, the experience for what it is. It doesn’t try to change it at that moment. That acceptance, though, does create an emotional platform in which changes for the better can be internalized. In this five-step process, it can be beneficial to immediately follow your time in stillness with a writing practice. Perhaps you make notes in your phone to list the things in life you appreciate at this moment. Perhaps you reflect on the experiences of the day, or the week, and note how those interactions or circumstances added value to your life. Even better, take time to make an inventory of your own emotional spectrum. What things would you like to change about yourself, and why? What things do you love about yourself—your unique strengths, desires, dreams, and skill sets—and why? From a young age, we are taught about opposites. Light is the opposite of dark. Tall is the opposite of short. Near is the opposite of far. Kind is the opposite of mean. Opposites simply highlight the contrast innate to all life experience. Awareness of those differences can then be used to determine what we most want in life. The interesting thing is that most people focus on what they don’t want, instead of what they do. By doing this, personal growth or lasting positive change is stifled. It’s important to look at the contrast and continually ask, “How would I like it to be instead?” The heightened level of awareness created in the three previous steps allows the mind to more readily articulate what it really does want to embody for the future. This is the point of step 4: To shift attention toward the wanted, and thus create a clear path for the future, as well as build the momentum needed to get there. Have students observe muscles that are shaking or tired when holding a posture. You can then speak uplifting, powerful words that they can imagine infiltrating the pose. You might say words such as STRONG, FOCUSED, POWERFUL, DEDICATED, or CERTAIN. This directs their mind to the positive spectrum of emotions without having to come up with any words themselves. 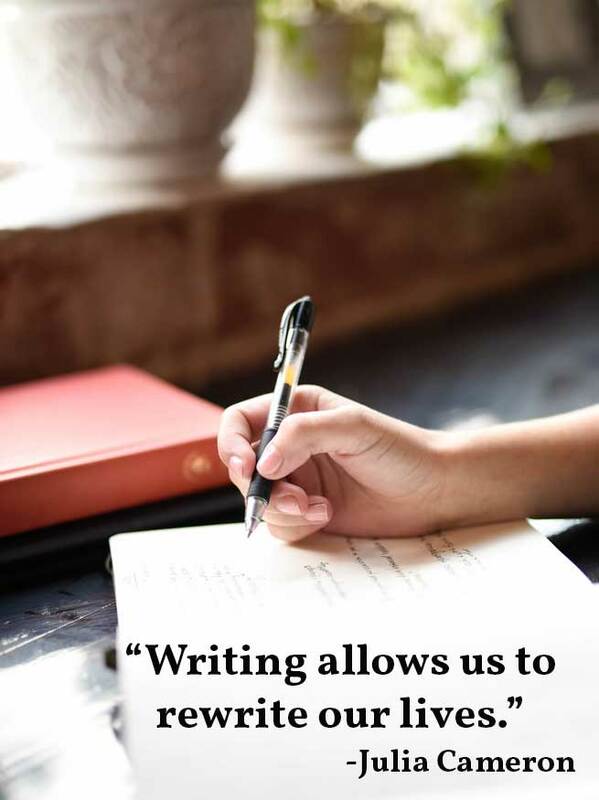 Continue with a writing practice, and fill in the blanks to train the mind toward a desired outcome. Today, I feel ___________ about my life. Example: Today, I feel unmotivated about my life. Example: The opposite of unmotivated is excited. Write a new sentence in your journal that says. Today, I feel [insert word from sentence 2] about my life. Example: Today, I feel excited about my life. Repeat the writing steps 1-3 above to discover your emotional relationship with any specific area of life. Examples include relationships, health, career, time-management, hobbies, spirituality, finances, yoga practice. The possibilities are endless. While you may not believe the third sentence just set, Step 5 will allow you to internalize that new belief. Now, it’s time to internalize the beliefs and emotions that will align with your intentions. The tools provided in this step create changes at the subconscious, cellular level. And the best part of it is, instead of managing symptoms of dis-ease in your life (such as stress, frustration or physical pain), you can now remove the source of the discomfort in the first place. You discover real, lasting solutions to any lingering issues. 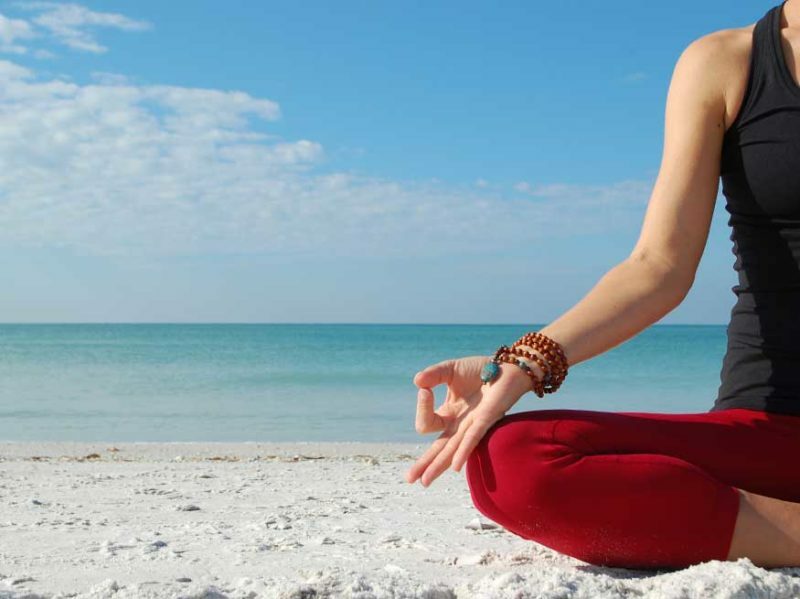 The physical practice of yoga includes numerous asanas that create a cross-over pattern in the body. When arms and legs cross over one another, this confuses the conscious mind (left and right aspects of the brain) and opens up the subconscious to be reprogrammed. While leading students through various cross-over postures, or an entire cross-over class sequence, have them silently repeat positive phrases, such as “I am strong. I am dedicated. I am in control of my own life.” Any statement that is first-person, positive, and present tense is a great way to start. You can also have them lie in savasana, in a cross-over posture, to internalize a positive statement, too. Use any powerful phrase to reinforce their awareness, acceptance, and greatness. Sit in a brain-integrated posture, a cross-over posture, from a comfortable seated or supine position (see image below). Repeat a positive phrase created Step 4, and say that statement to yourself until you are tired of hearing it. Within a few minutes, you’ll notice an internal shift. Internalize new beliefs throughout the day by repeating positive statements in this cross-over posture. 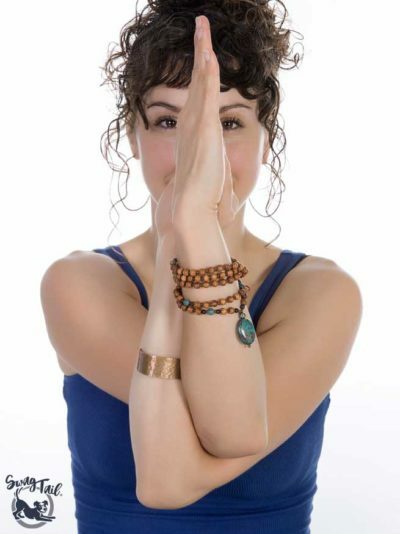 Anjali Mudra brings the palms together at the heart, usually at the end of each yoga class, to honor the inherent worthiness within the teacher and students alike. It acknowledges our ability to remove negative habits, accept who we are, trust our place on the journey, and embrace a bright future with confidence. Anjali Mudra also seals in the magic of the entire five-step process. It locks in the heightened level of awareness and the new, positive beliefs that were internalized through any cross-over patterns of the body. Just a few rounds of breath in Anjali Mudra, whether done in class or off of the mat, can have lasting effects. Set an intention. Be clear about why you are engaging in the action, and what you want to experience as a result of it. Example: Go watch a sunset and honor your changes as the sun sets below the horizon. Keep things simple. The five-step process adds more clarity to your life experience and finding simple ways to implement it can be the most powerful. Example: Post your positive statements in your daily planner for you to see regularly. Have fun! A playful attitude always brings more joy to the journey. Example: Set the home screen picture on your phone to one of you in your most authentic, joyful space. Allow this reminder to set the tone each time you pick up your device. Perhaps the best action you can take, though, is to make this 5-step process a regular part of your daily routine or teaching methodology. When you share these techniques in class, you amplify the powerful changes yoga can make for your students. And, you allow the foundation of this process to be embraced when they’re off the mat, too.